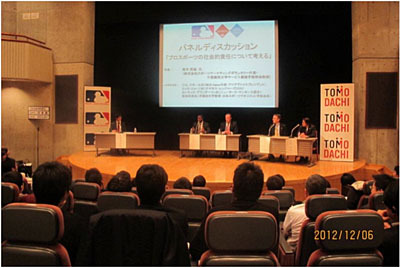 Curtis Granderson was a keynote speaker to about 300 audiences, mainly college students, on December 6 evening at Waseda University in Tokyo on “Corporate Social Responsibility within Professional Sports” from a MLB player’s perspective, followed by Jim Small, CEO of MLB Japan and MLB Asia VP, from MLB’s view point and Rick George, COO of Texas Rangers from MLB Club’s standpoint. Afterwards, they participated in a panel discussion joined by Professor Munehiko Harada of Waseda University and President of Japanese Association for Sport Management. The participants from the U.S. explained various activities in concrete descriptions how they strive to perform desired behavior in local community in addition to offering baseball as an attractive entertainment sport. Rick George gave advice to the Japanese students of sports management (1) Develop skill required in sports-related industries, (2) develop net work of key leaders and mentors and (3) be willing to take risks. MLB, MLB Players Association, the U.S. Japan Council and the Japan Cultural and Community Center of Northern California made a one-million dollar donation to refurbish the facility as part of TOMODACHI, a public/private partnership led by the US and Japanese governments to rebuild Tohoku region of Japan.